Alouette is a non-profit making organisation so learning with us means you will be getting the best value for your hard-earned money. As a member's club, we are quite informal but this does not detract from the professionalism of our instructors who offer top-class training. Payment can be made on a pay-as-you-go basis so no need to worry about drawing out those savings - you can fly as, and when, you can afford to. But if you prefer, we do offer an introductory discount package, see below. No matter what age you are, you will be welcome at Alouette as we have students of all ages. You can start your training from the age of 14 and there is no upper limit - you are never too old to learn! WE NOW OFFER AN INTRODUCTORY 5 HOUR TRAINING PACK! 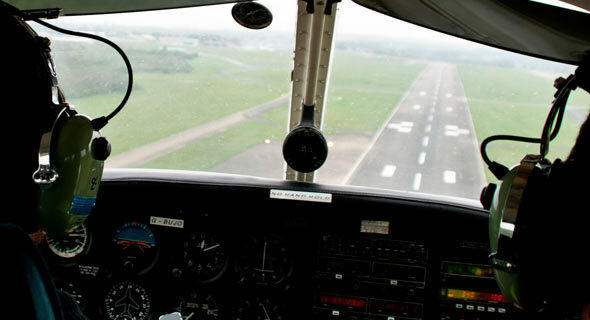 At the end of the five hour course, if you decide to continue with training for your pilots licence you just pay the appropriate club membership fee which is currently £200 April to April, or pro-rata amount when joining mid-term. To take advantage of this offer, simply speak to the instructor that you fly with on your trail flight and ask for the application form. You can still opt for our fully inclusive trial flights and many students prefer to do so for their initial flight before signing up for the package above. See our trial flights page for more details. We have four resident instructors and an examiner and offer flight training including EASA PPL, IMC, Night Ratings, Safety Pilot courses and check-outs. Our flight instructors are long term members who instruct because they love flying and between them they can provide training during the week or at weekends to suit your availability. Training for a PPL requires you to understand the theory as well as the practical side of flying and as you progress you will be required to pass various exams to prove your knowledge. Your instructor will be able to advise on the timing of these exams and also on what books you may need to study in order to pass them.You will also need to buy certain equipment such as a ruler, map, check list etc. but as a member of Alouette you won't need to worry about headsets as these are provided by the club. Flight planning is an important aspect of flying and includes checking the weather, both current and forecast, in order to make sure your flight is both safe and legal. 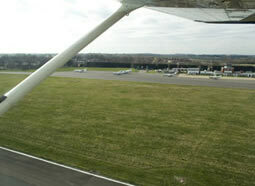 For instance visibility must be above a certain level for you to fly, even with a licence. As a student, you will normally fly with 10Km visibility or more (often known as "all the 9's"). Also you will be shown how to check NOTAMs (Notices to Airmen) to ensure you are aware of any restricted airspace or other problems you may encounter, you don't want to become part of a Red Arrows display do you? Alouette has a dedicated PC with a broadband connection for members to use for this purpose. 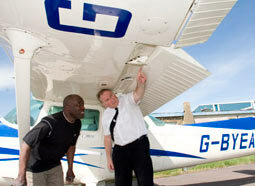 As the student pilot, you will be expected to check out the aircraft to make sure all is well before you climb in. This will take the form of a walk around the aircraft, following a check-list to ensure you don't forget anything. Don't worry, it's not that difficult but it is essential for obvious safety reasons. Your instructor will guide you through the process which will become second nature in a very short space of time. But it doesn't end there as there are more checks to do when you climb aboard, again following your check list. Once inside the aircraft, your instructor will show you how to run through the interior checks, which will lead to starting the engine. More checks follow, including tuning the radio and finding out which runway is in use. Biggin Hill has an ATIS (Airport Terminal Information Service) so you will need to listen to this before you call up for your taxy clearance. This will give you not only the runway in use but what frequency to call the tower on, the wind strength and direction and other useful pre-flight information. The final checks are usually done away from the club house as it involves running the engine up to a higher RPM so after obtaining your taxy clearance you will pull away to an area used for the purpose. This will depend on the runway is use but air traffic control will direct you and, as always, your instructor will assist. 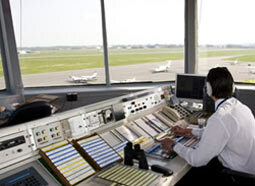 Then its off to the hold point, inform ATC you are ready for departure and wait for your clearance to enter the runway. As using the radio can be a bit of a daunting process, especially in the early days of your training, your instructor may well do this for you until you become more comfortable with the process and the 'jargon' that at first may seem hard to understand. A big part of your early training will be spent 'in the circuit' which means you will be flying a rectangular patterns around the airport practicing landings and take offs as well as 'touch and goes'. 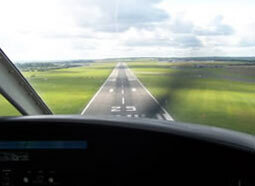 However you will also spend time away from the field becoming familiar with the various aspects of the aircraft you have chosen to learn on including how it handles at different speeds with and without flaps, how to carry out a coordinated turn properly and how to monitor the aircraft's systems, including radio navigation. You will also learn how to keep in radio contact with the relevant authority for the airspace you are flying in, or planning to fly in. 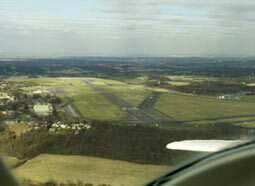 As time goes on your instructor will take you further afield and you will no doubt land-away at other airfields. For instance the Isle of Wight is a popular destination and the trip will involve navigation, use of the radio and landing at a new airfield - all good experience but also fun to do! 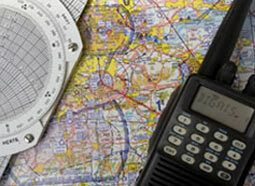 At some point prior to flying solo you will need a Class 2 medical. Depending on your age, this will need to be renewed from time to time, for instance up to the age of 40 its every 5 years. In reality it's best to get this out of the way early on during your training. During your training you will pass various milestones but you may be surprised how quickly you progress, most students learn to take off and land the aircraft after very few lessons. Of course the first big step is the first solo which will take place when the conditions are right and your instructor feels you are ready. There is nothing to beat the experience of getting airborne on your own and being in sole control of an aircraft as a Pilot. Alouette recognise this achievement by providing you with a certificate to mark the event, one that you can be justly proud of. The final stages of your training will see you doing plenty of solo circuits and landing away at various airfields in preparation for your 'solo cross-country' which is a qualifying stage of your training and is the culmination of your skills. It won't be long now before you take that final step and qualify as a pilot by completing the skill test with an examiner to obtain that much coveted Pilot's licence!